This was at Richard's house in Tockington. David Northcott brought what he believes will be his last ever Bugatti! It has better proportions than previous efforts and uses a discreet electric motor for power. David Worth had a range of models from modern sets, e.g.this crane, plus a model of a ship's windlass, all brought by train from Devon in a rucksack! Terry Childs is working on a Shay geared steam locomotive. So far he has built the chassis which ran well on specially built track. Neil Bedford brought the latest version of his Scammell Explorer. It now has a fully working ‘rear end’ and improved fine detail all around. Richard Smith had been working on his caterpillar track model which now has an improved motor unit. However, instead of being a crane it is now going to be a drag-line. Pete Evans has a soft spot for the excellent No.10 set models designed by Tony Parmee. He entertained us with Tony’s improved version of a digger. Malcolm had built a new model of a Congreve Rolling Ball Clock, having bought the instructions and all the extra bits needed after the Thornbury show in August. A jolly evening was had by all at Malcolm’s in July. 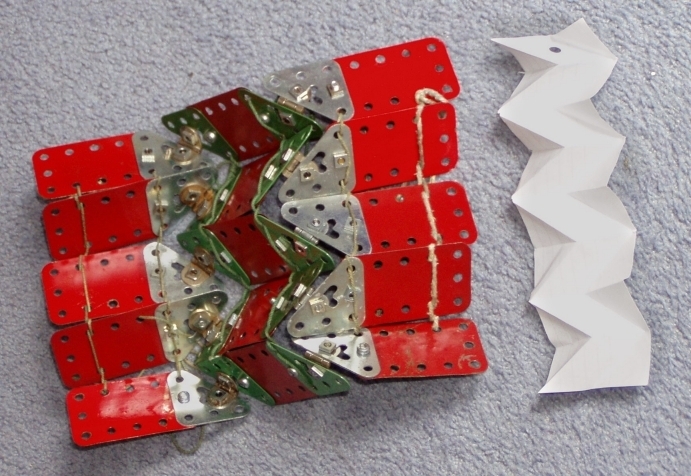 Sam Medworth brought a Meccano version of the folding plates that form the basis of solar panels for powering space vehicles. He also showed a surprising variety of Meccano spanners from the Mechanics Made Easy era (early 1900s) to those from the current Nikko Meccano sets. Richard Smith was taking a break from his Canberra bomber and instead showed us the beginnings of a Supermodel No.1a type car chassis. In similar vein Neil Bedford did not have his sophisticated Scammell explorer but some far simpler clockwork driven vehicles including an autogyro and a very nice truck made by his daughter Forrest. On this occasion the clever stuff came in two forms. Firstly, a Sinclair Harding Clock from Mark Bridle based on a Michael Adler design. These clocks were designed to work effectively on ships and not be influenced by rolling movements in high seas. The second smart model was a walking dragline, in the process of construction, from Terry Childs. This is a version of the model that appeared on the front covers of Meccano manuals between 1956 and 1961. David Miller pedalled over with a charming little rickshaw model with just one wheel. Malcolm had just given an illustrated talk on Meccano to a local branch of Probus and so showed some of the items (a) (b) he had dug out for that. There was a good and very enthusiastic gathering at Philip’s on the 6th. Jan.
David Northcott had landed a Barracuda fish! A juvenile at only 3ft but still pretty fearsome and a superb use of old cleaned up flexible plates. Sam had been working on a robotic arm. It has five separate movements all controlled from a single control device through five motors. David Miller had a ‘modern’ set mobile crane that slews and hoists in a quite realistic manner for a relatively inexpensive set. He also had a more traditionally built flatbed truck designed as a plaything for his grandchildren. To keep them entertained it was a) robust and b) had lots of moving parts like a crane, a steering wheel that worked and side flaps the swivelled up and down. Our host Philip has been taking an interest in the Clifton Rock Railway. The now abandoned device was water driven with four separate carriages that took passengers from the Portway up to Clifton. Philip’s model has two carriages but is otherwise a very accurate copy of the original. Malcolm brought some items from the mid-60s yellow, black and silver Meccano period. These included a Junior Powerdrive set, some advertising literature and the No.10 set model of a freight ship. Sam brought some second-hand 1980s Meccano which was auctioned and raised £80 for Julian House Night Shelter in Bath.